WishIHadThat is a direct manufacturer and importer of a huge selection of custom and logo waterfalls. We can create some fantastic waterfalls for your home, office, restaurant, etc. You will find an unmatched selection of stock and other custom features on WishIHadThat, but if you don't find what you're looking for, just let us know and we'll either build it for you or go find where to get it! For selection AND service, plus our 30 day no-hassle refund policy...well, it's hard to find a reason NOT to purchase from WishIHadThat! 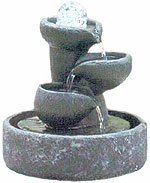 See samples of the fountains we can custom build for your business or home. 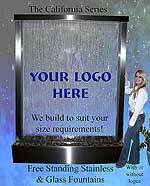 For a business fountain, Wishihadthat can incorporate your logo into the surface of the fountain. With over 200 wall fountains, designed from materials such as slate, rock, stainless steel, and copper, you will be able to find the perfect fit for your wall. We have a huge collection of Acrylic Fountains, Aquariums, Lamps, Tables, and more. Floor Fountains are free-standing, so they are easy to set up and can be displayed anywhere you have access to a power outlet. 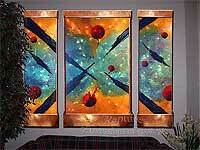 This section is dedicated to our Copper Fountains that are wall mounted. This collection features some small to large ornate molded fountains designed for placement on or against a wall. 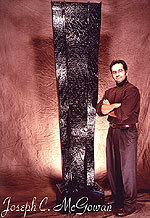 Included in this collection you will find the Grand Stone Collection, a series of large floor and free standing pieces. This collection of bronze fountains ranges from small animal bronzes up to lifesize bronzes. With over 100 bronze fountains to choose from you are sure to find one to fit your home or garden. We have dozens of beautiful garden waterfalls, ranging in price from under $200 to almost $15,000. These waterfalls will make you think you're looking at real rock! We have several beautiful waterfalls that cascade directly into your pool! Table Top Fountains are perfect for interior spaces. 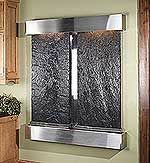 They are lower in price and take up less room than most floor fountains and wall fountains. 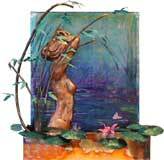 Here's our latest line of wonderful copper fountains! 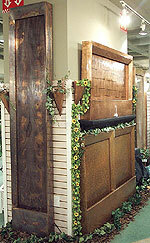 We have large wall mount, free standing floor fountains, tabeltops, and more. The essence of the ocean, sparkling rays of sunshine dancing, deep mysterious shades of blue and purple reminiscent of a moonlit sea...the beautiful and contemporary sculptures of art will capture your imagination. 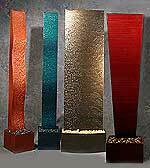 We have a very unique variety of wall, floor, and free-standing custom metal fountains, too! Bring the sounds of a peaceful brook into your home or garden with these beautiful metal fountains which are handcrafted from copper and various other metals. Items you need to create your own pond, from liners, pumps, fountains, filters, chemicals, etc. A complete lineup of chemicals for your fountain or waterfall!